Artistically altered photographs of an all-black pussycat make a cool, personalized finishing touch for your outgoing mail. One thing you'll notice about black cats is how their dark fur makes their eyes pop! 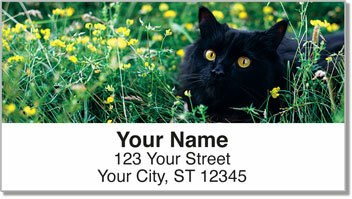 Look at the expressions on the face of the kitty featured on these return address labels. It's like you can tell what he's thinking! 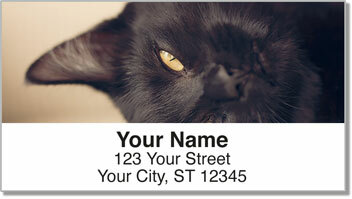 You'll think these address labels are a super time-saver thanks to the self-adhesive backing. 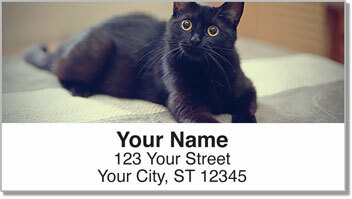 When you discover how easy it is to finish filling out envelopes, you just might start to purr. 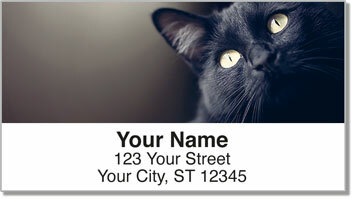 Get your very own Black Cat Address Labels right now! Order them with a set of matching checks.